Welcome to Day 7 of TLC for your gut, by using juicing with protein to bust sugar cravings! Sign up for the email if you want to receive a happy-gut tip every day for the next three weeks. Immediately improve your gut health, and make it easy to love your belly, so that your belly loves you back! 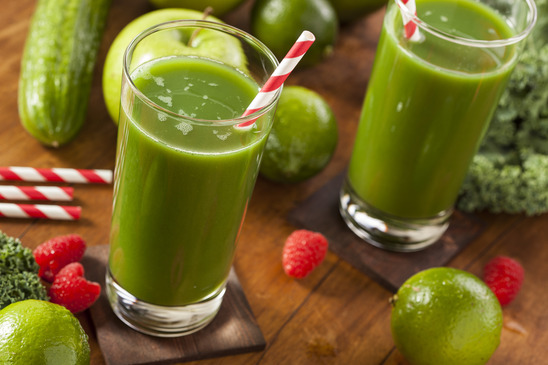 My motto for high-energy is GO GREEN—and the easiest way to achieve your fruit and vegetable requirements is juicing. While I still recommend eating whole produce, juicing—when done right—is an excellent source of vitamins and minerals. Therefore, the key is picking the right combination of fruits and vegetables for your gut. For a thorough guide, pick up my It Takes Guts to Be Happy! book or audio book. Nevertheless, today I am discussing my tips for juicing to avoid sugar cravings and at the same time, drive up your energy levels. In fact, juicers can be expensive; and unless you own one or are willing to buy one, a simple blender can start your juicing journey. First, though, just make sure to remove the skin, seeds, and rinds, as well as add water for smoothness. If using a juicer, save the pulp and blend into your juice or add to meals later to maintain your fiber intake. If you are prone to gas and bloating, avoid mixing fruits and vegetables in juices and smoothies. On the other hand, your local juice bar will likely advertise wonderful-sounding drinks that blend apple or pineapple with kale and spinach. While some people’s guts handle doubtful combinations, other people’s guts might become bloated and gassy. However, if you can handle fruits and vegetable blends, I recommend a colorful combination for optimal nutrient levels. Notably, this will help to avoid sugar spikes from a fruit overload. Check with your doctor before consuming a high quantity of juicing to avoid any issues. Try three delicious smoothie recipes below to turbo-charge your day. However, be sure your produce is organic. Juicing includes a variety of benefits such as weight loss, digestive health, and appetite control. An important tip for my juice recipes includes adding protein. Unfortunately, juices lack both fiber and protein without their pulp. Therefore, in order to remedy this nutrient gap, I add one or two scoops of ALL DAY ENERGY to all my smoothies and juices. Additionally, my ALL DAY ENERGY contains 15 grams of all-natural pea and rice protein as well as 8 grams of fiber. In addition, while this supplement is sugar-free, it also provides a vitamin and energy boost. Indeed, protein is important in juices and smoothies because it helps curb sugar cravings. ALL DAY ENERGY saves you from the consequences of too much sugar including weight-gain, acne, wrinkles, and disrupted digestion. For extra doses of protein add chia seeds, avocado, coconut, Spirulina, or wheat grass to blends. Happy-Gut Reminder: Lastly, if you feel weak on a juice fasting day, add protein and fiber for strength and stability. ALL DAY ENERGY will quickly remedy your nutritional needs.